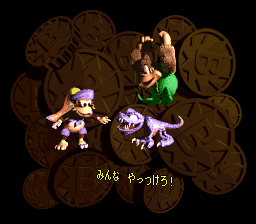 I'd really like an updated DKC3 Sprite viewer! Awesome, when will this DKC3 sprite view come out? Most likely a couple of weeks from now, when I don't have a final project and two exams hanging over my head. 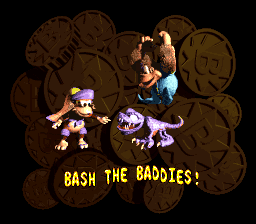 I would like to back-port a few of the new features of this one to the DKC1 and DKC2 sprite viewers (namely, the dual-palette functionality and the ability to view all sprites with their proper graphics; the latter of these is done with the exception of displaying the graphics locations for these sprites), and release all three updated versions simultaneously. Okay then, I'll have to be patient. Yep, don't mind us Mattrizzle. We don't want to rush you. geno wrote: Updated DKC3 Sprite View? Here, along with the updated versions of the DKC and DKC2 Sprite Viewers. Since there seems to be some demand for this, I've quickly slapped together a DKC2 Sound Test patch. This patch disables all music in the game, and hijacks the pause routine to have a Sound Test Menu. Press L or R to cycle through the different music/sound banks (this takes time, as sound data and sample data have to be written to SPC RAM) Right or Left on the directional pad increments or decrements the sound value, respectively. The Y Button plays the sound effect with the selected value. Give it up for... the genius and amazing Mattrizzle! You know, as you're popping out these useful and innovative patches left, right and centre, I'm beginning to picture an ultimate customisable trilogy of DKC(/2/3) hacks in the future, which contains all of the tweaks and options you're developing - all rolled into a single IPS for each game. They would essentially look and play exactly like the games we know and love, but would have subtle (but (probably) easily accessible) menus/toggles for all the features, settings and alternative modes you've been developing. I do wonder how many of your hacks are 'compatible' with one another - as in, they don't make conflicting changes to game data, etc... it could be really awesome to have a single hack for each game provide the original adventure, and so many different ways to explore and appreciate it. Mattrizzle you are the best Donkey Kong Country hacker in the world, you can even hack the 3rd game pretty well, I think you need to make a full Donkey Kong Country game hack, with custom objects, levels, etc., I bet it would be awesome. I fully expect someone to do a full DKC2 sound rip now. EDIT: Thiiis could take a while to do. It's not just 7F SFX, but 7F for every single bank (duplicated or not, how the heck am I supposed to know?). EDIT 2: Seems to be the same sounds but with a different set of source audio. Mattrizzle, any insight into this? I don't want to waste my time trying to record everything and find out I could have done things a faster way (don't worry about my recording setup, I have that covered. I'd just like to know what's going on with the SFX and whether they have the "same" sounds for each "bank"). All I know is that the "Kremkoin Appear" sound, sounds weird on any sound bank except the "Bonus" one, and the "Swanky" one. 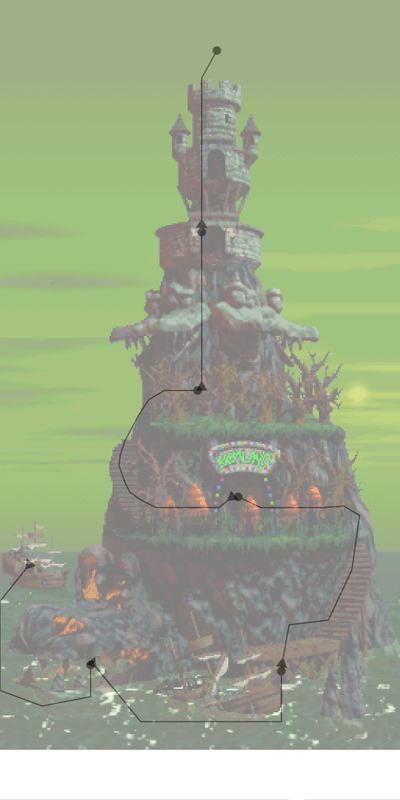 A custom level theme function for the Gang-Plank Galleon tileset, with a palette resembling the end of Gangplank Galley in DKC2. I personally think this sunset aesthetic is a much more fitting 'end of the adventure' theme than the bright daylight look of the original Gang-Plank Galleon. 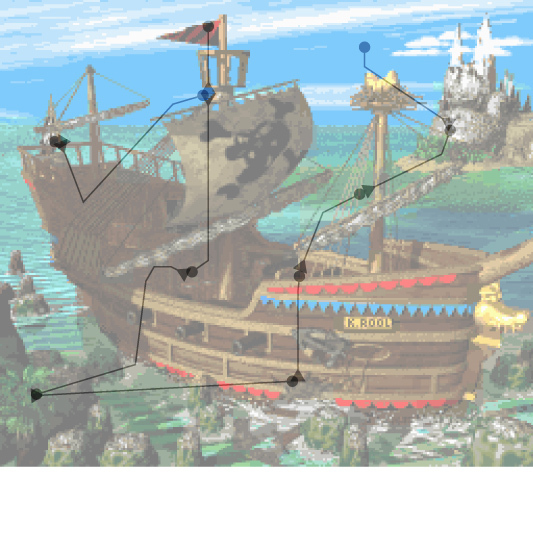 I immediately noticed the Gangplank Galley palette similarities, and I think it works smashingly in this context! Would love to see this as part of your magnificent and ever-evolving Boss Blitz. 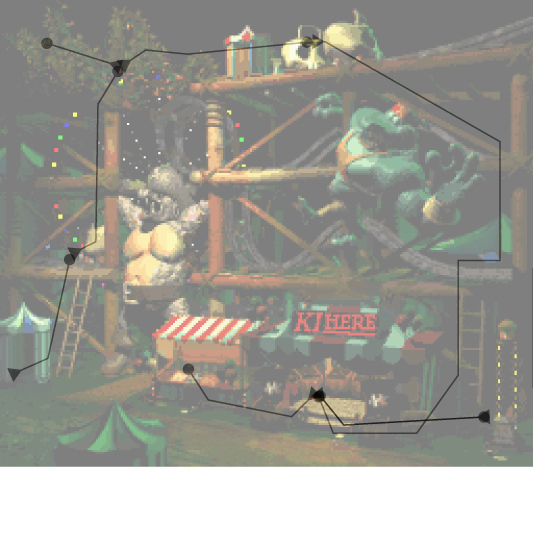 I was able to extract the path data from DKC2 as vectors! I think there's some unused paths there too..! I'm writing a technical specification as we speak. And fantastic job, Matt! Really fits the theme. Oh nice! Very cool... I don't think any of the paths in your Krem Quay image are unused, but still — awesome stuff. You could totally remove that image from the spoiler if you like... this development deserves exposure! When I was looking for data for DKC2: Brigand Barrage, I found one peculiarity in the level/world names. 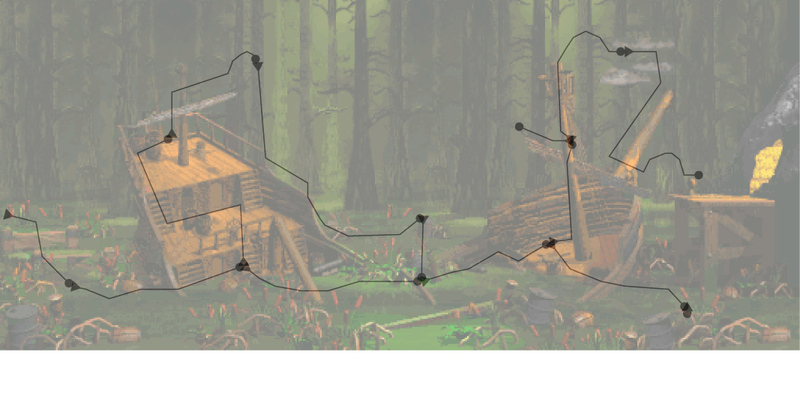 There's actually text for the "LOST WORLD", but you never get to see it in the game. And Matt, you're right. It even has a point assigned to it in the coordinates, unless I'm mistaken. If any of you guys have an SVG editor, here's the file so you can knock yourselves out. The first polyline is the first path in the path table and the second one after that, etc. They're all on top of each other, so you might have a hard time dismantling the spaghetti! <svg version="1.0" id="Layer_1" xmlns="http://www.w3.org/2000/svg" xmlns:xlink="http://www.w3.org/1999/xlink" x="0px" y="0px"
EDIT: Behold, all the paths overlaid to the maps I guessed they're supposed to go onto. Triangle means the beginning of a path, dot means a stop, respectively. In order to be able to use the layer 3 snow, I had to shift the palette lines used by everything else... Fortunately, the boss lair archetype has an unused palette line. I never understood why the GBA version added stalactites to this battle. 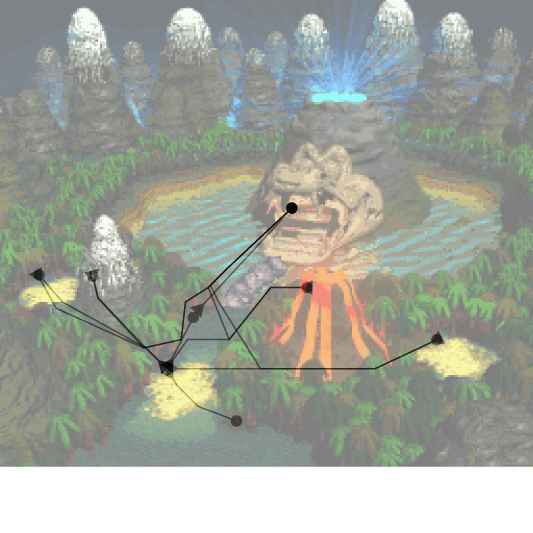 There are clouds in the background, and none of the maps have a cave entrance where the boss level is. They added those just to make boss harder and avoid all the logic, i guess some Necky dropped them or something. Mattrizzle, that looks absolutely amazing! I LOVE how it actually matches the world type! Magnificent! Looks really nice, and matches the theme of the world perfectly. 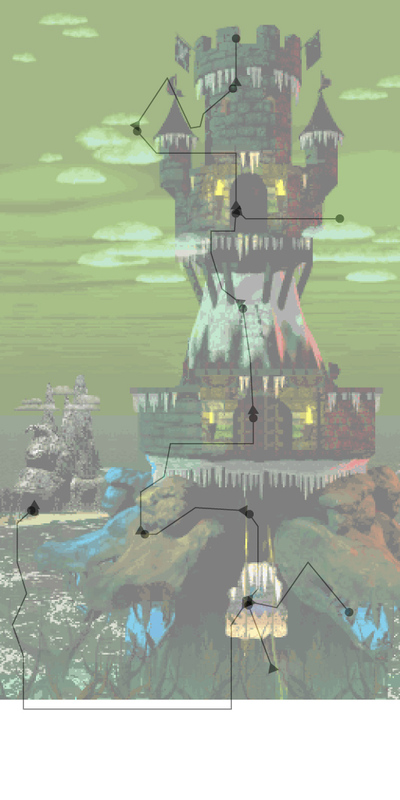 I'd say there's a good chance that Rare's DKC GBA port team forgot/never knew that these 'lairs' weren't actually in caves. Ever wanted to see what the DKL3 prototype would be like in color? Well, soon you will be able to! I took the Japanese version and ported the level layouts from the English prototype. I also changed the required time of Whiplash Dash to 45 seconds like it is in the prototype (it still isn't too hard to beat). - Merge this with the English patch, using the text strings that were present in the prototype (e.g. the various typos like KROOL in the cast list, and him referencing the watches when approaching him in K. Rool's Last Stand). Amazing! You never fail to impress, Blaziken. That DKL3 prototype might just be neglected if it weren't for you. Remember, I'm like your biggest fan Blaziken. I'm always excited for your projects and such. If I could one day experience ROM hacking to follow your footsteps... Anyways, I love it. I love the Japanese DKL3 GBC convert to English, I love the typo fixes in it, everything. Color hack from 2008. You are my favorite ROM hacker out of them all. I can't wait for this new project. Good luck! Now I just have to do a 103% test run and if all is well, I'll release it. Also, I forgot this in my last post, but I wonder if I should make the Time Attack data compatible with the prototype. The prototype and retail ROMs use slightly different Time Attack checksum mechanisms, so saves between the prototype and retail ROMs aren't compatible in this part of the game (without hacking). Right now, Time Attack data in this hack is compatible with the retail ROMs, but not the English prototype ROM. I can choose the former or the latter, but not both -- what do you all think? 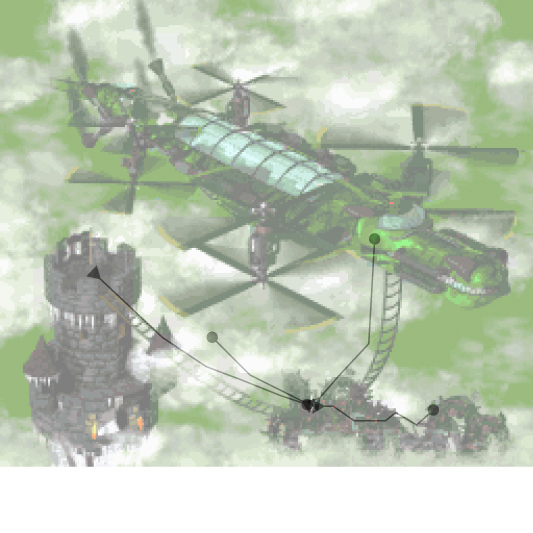 I like the way DKC2's Zinger looks in green... nice work! I'll embed the YouTube clip, and move this into the 'small hacks' topic. Using this patch, if you have a corrupt save file, but working backup copies of the save file, the game will now load the working backup save file properly, as was originally intended by the developers. While this may not be needed much on an emulator, it could be helpful when playing on a real Game Boy, as cartridges are prone to data loss. If you want to see this for yourself, open a hex editor and edit the data in offsets 0x00-0x4F (for file 1), 0x50-0x9F (for file 2), or 0xA0-0xEF (for file 3). With the patch, even after editing this data, you'll see that the save data will be what it was before you edited it (assuming that you don't mess around with the backup copies further down in the save file). Without the patch, you will see your changes to the save files when you play the game, which means that you're playing a corrupted save file. http://www.mediafire.com/download/ub5eye7dr7q47a8/DKL2_-_3DS_VC.ips ← New patch! 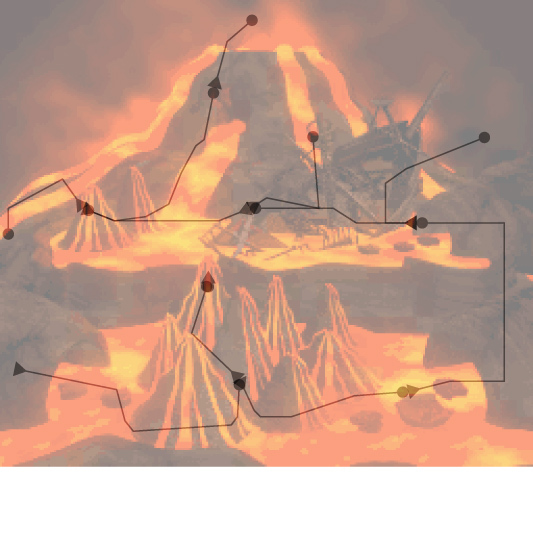 The previous patch only modified Glimmer's Galleon; now this one also modifies Lava Lagoon and Clapper's Cavern. To be clear, I didn't extract the ROM from the 3DS (I don't know if that's possible); rather, I took a Game Boy version of the game and made the same change from scratch. I compared the behavior of this patch closely to the behavior I saw on the 3DS, so this should be accurate. This should work on both the English version and the Japanese version, as the offsets for the ASM code changes are the same. If anybody wants me to post the ASM changes I made, I can do that. EDIT: I initially only noticed the change in Glimmer's Galleon, but I since noticed the change in Lava Lagoon and Clapper's Cavern as well. I updated the patch to reflect this. I also made a note that the patch works in both the English and Japanese versions, whereas I was previously uncertain that it worked on the Japanese version. Duuuuuuuude, nice. It's like the Kremlings polluted the sea with radioactive gunk. Will their perverse conquests never cease??? Keep working at it. It looks really nice. I'd love to see more screenshots. Someguy messed around with the credits after you beat King K. Rool the first time. Here is a small hack for DKL2 and DKL3 that lets you keep the Banana Coins and Bear Coins you have collected, even after turning off the game. 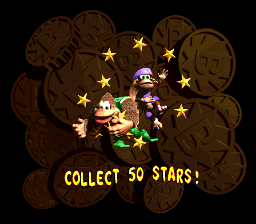 Normally, when you turn on either game and select a save file, your Banana/Bear Coin count resets to 0, but with this hack, the count will be whatever it was the last time you saved. This is similar to DKC3, as well as the GBA version of DKC2. 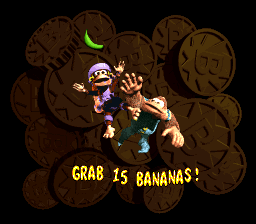 This is actually unused behavior (which was very recently discovered); when saving your game at Kong Kollege or Wrinkly Refuge, your current Banana Coin / Bear Coin count is actually saved to SRAM offset 0xA009 (file 1), 0xA059 (file 2), or 0xA0A9 (file 3). (When looking at a .sav file in a hex editor, these offsets would correspond to 0x0009, 0x0059, and 0x00A9.) And when you load a save file, this count is then written to HRAM offset 0xFFB3 (or 0xFFB2 in the Japanese version of DKL3). 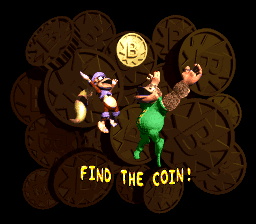 Sounds good so far... except that when the Krocodile Isle / Northern Kremisphere map is loaded afterwards, this byte (0xFFB2 or 0xFFB3, depending on the game) is then reset to 0, so you lose all your Banana/Bear Coins. This is part of a subroutine that sets a few bytes to 0. I am not sure if resetting your Banana/Bear Coin count to 0 was intentional or not. In any case, all this hack does is change two bytes to remove the code that resets HRAM offset 0xFFB2 or 0xFFB3 to 0. And now for some links to some patches. Be sure to pick the right game and version! 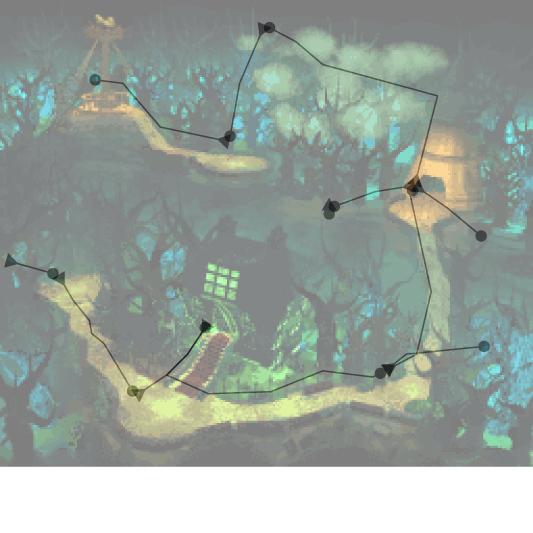 I've overhauled my Cranky level hint fix patch. Instead of an IPS patch, it is now an Asar ASM patch. Remaking it in this format allowed me to implement conditional statements in the patch, which means it now works on every version of DKC (except the competition cartridge, for obvious reasons)! In the French translation (top right pic), the hint for Trick Track Trek (Trajet Toc Toc) was accidentally assigned to the incorrect world -- it appears in Gorilla Glacier (Glacier des Gorilles) instead of Kremkroc Industries Inc. (Kremkroc et Kompagnie). Given that these hints are unused anyway, it's no surprise this wasn't corrected for European version 1.1. The German translation (bottom left pic) is the only one lacking a hint for Trick Track Trek (Trick Track Treck). In its place is an exclusive hint for Oil Drum Alley (Oelfaß Boulevard). Not all of the languages have an equal number of hints. While English and Japanese each have 27, German is missing one for Orang-utan Gang (Gang Orangutan), and French is missing five -- Barrel Cannon Canyon (Canyon du Tonneau à Canon), Snow Barrel Blast (Bang Neigeux du Tonneau), Ice Age Alley (Allée de l'Ere Glaciaire), Croctopus Chase (Course de Kroctopus), and Elevator Antics (Ascenseurs Excentriques). EDIT 9/9/2017: Fixed links in this post. How does an ASM patch differ from an IPS patch? Are there other advantages to using ASM over IPS? Furthermore, is it possible to create an ASM patch? Asar is an assembler. ASM files are like source code files: they contain 65c816 code, which is the assembly language the SNES uses, and can also include comments, define statements (variables), and macros (shortcuts for sets of instructions), and conditional statements (e.g. if, else). When you run Asar, this source code is assembled into SNES machine code (binary). In this case, I used conditionals to determine which version of DKC is being patched by checking the values of bytes in the ROM's internal header (NOT the copier header). Specifically, the country ($80:FFD9) and revision ($80:FFDB) bytes. 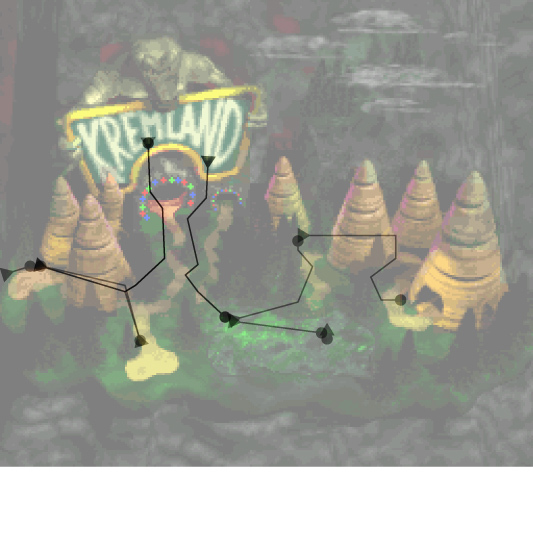 Depending on the values here, I set certain variables to different values, so that the correct location in Cranky's text routine is hijacked for each version. For instance, in US version 1.0, $80:ED1F is the correct hijack location. In European version 1.1, the equivalent location is $80:ECC0. Thanks for fixing that Mattrizzle. I always loved that patch but it froze on bosses. Are you still working on those Boss Rush hacks still? Is your ROM a headerless smc file? If so, change its extension to sfc. If the ROM's extension is smc, Asar will assume it has a header. If it is sfc, Asar will assume it doesn't have a header. I got it working. Thanks again. I created these custom demos with a separate ASM hack that records button presses while playing any level and saves this data to SRAM, but I haven't released it yet because I still need to iron this out (I've seen occasional desyncs). I'd also like to make a tool to extract this saved data and insert it into the ROM, but I haven't started this yet, and I don't know when I'll finish it (due to limited free time). But for now, you get to enjoy custom demos! And eventually, I'd like to make this work with DKL2, and maybe even DKL as well. But I haven't started those games yet. Don't ask me when I'll be done with all of this! sounds intriguing! Could you provide a youtube video or something of your hack in action? 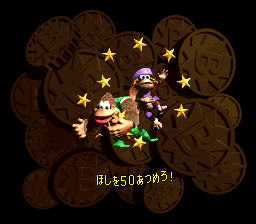 Here's a small hack that I made for DKL3 GBC -- this one replicates the behavior in bonus stages in the SNES versions of DKC2 and DKC3, in that when you're running low on time in a bonus stage, the music will continually speed up. Specifically, the music tempo will speed up once the timer reaches 10 seconds, and will speed up again once it reaches 5 seconds. While I only briefly tested this in a bonus stage, it does work, and doesn't appear to break anything else. There are other examples, but if you see those videos, you'll get the idea. If you use an emulator with a memory editor (such as FCEUX for NES or BGB for GB/GBC), you can edit these values, and they will instantly alter the music tempo. Try it, it can be amusing! Naturally, the Donkey Kong Land games (as well as DKC) could have had situations where the music would change tempo in certain situations, but it seems that Rare didn't really care about this at all in these games. So, it's a wasted opportunity. One obvious scenario would have been the bonus stages, which is where my hack comes in. Rare could also have made it so that the music speeds up as you deal more and more damage to a boss (like in the Battletoads games). There could have been other possibilites that I'm not thinking of. It's a shame that Rare didn't bother at all with this. # to add a hook for new code. ROM5:4FB2 18 25 jr 4FD9 # Jump to whatever needs to be executed next. # Replace this code with a jump to unused space in ROM. # The start of unused space. # Note that the tempo of the bonus music is normally CC. ROM5:7E01 FE 06 cp a,06 # Are there less than 6 seconds left? # tempo. We're done here. ROM5:7E13 C3 D9 4F jp 4FD9 # We're done, so exit out of this code. ROM5:7E1D C3 D9 4F jp 4FD9 # We're done, so exit out of this code. Needless to say, if you are interested in modifying this code yourself, use BGB, open the debugger, and set a breakpoint at 5:7E00. If you are more comfortable with a hex editor than a disassembler, and you feel that the tempos are too fast or too slow and you wish to adjust them, then you can go to offsets 0x17E0E and 0x17E18 and change these bytes. Side note: I took a very brief look at the SNES version of DKC2, and the tempo doesn't seem to be implemented the same way as Rare's GB and NES games. I tried to use a RAM search in BizHawk when in a bonus stage, and kept running searches when the music sped up, but I couldn't find any byte in RAM that stores the current tempo. Granted, I've had very little experience in hacking SNES games, and none of it involves ASM, but I still find this surprising that I couldn't find the byte for the current music tempo there. Finally, I plan to make a similar patch for DKL2, but most of Rare's games are more difficult to hack than DKL3 GBC or DKC GBC, because they're extremely tight on space, and adding anything new to these games requires expanding the ROM, and then repointing lots of code and data thanks to the Game Boy's 16KB banks. That's not to say that it's impossible, but it takes extra effort. By the way, this is largely why most of my hacks are focused on DKL3 GBC rather than the other games. 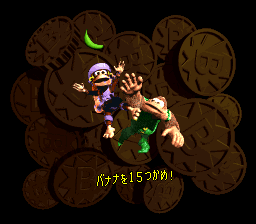 And now for a minor hack for the SNES version of DKC3: This fixes Kiddy's color palette in bonus screens when the COLOR cheat is used. Specifically, in the retail game, Dixie's color palette was properly adjusted to dark purple, but Kiddy's is still blue. This hack makes Kiddy's palette green as it should be. This change was backported from Japanese v1.1, the only known revision that assigns Kiddy's color palette properly. Below is a link to the IPS patch. It works properly on both the vanilla American and European versions (since their palettes are stored in the same offsets). This patch should be applied to a headerless ROM (which is exactly 4,194,304 bytes in size). And in case you're wondering, I haven't given up on Game Boy hacking completely, just taking a break from it for a while. So don't worry about that! What assembly tricks did you learn from the Game Boy releases that we could see once you move on to the SNES? This would be a major breakthrough that would help DKCRE immensely as well as my dormant DKCX game.